Have you ever been in Alaska? It is the larger state of the United States. Thanks to the Alaskan Highway, which goes trought Canada, this country is connected to the other states. Alaska became a state only in 1959 and it takes the name of “Last Frontier“: in this country there are many areas that have not been entirely explored because of the cold weather. However, there are many areas in Alaska that are full of wildlife. Do you want an example? The Katmai National Park! This park is situated in southwestern Alaska. Its origins date back to the 1918, when the First World War was finishing. Katmai includes the Valley of Ten Thousand Smokes, that is a zone mainly occupied by active volcanoes. In fact, three years before the establishment of the Park, one of the volcanoes produced one of the most violent eruptions. 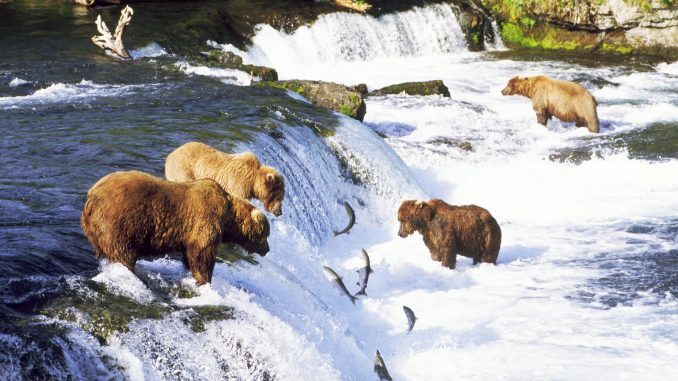 Nevertheless, what makes the Park unique is the presence of brown bears, which attracts many tourists from all over the world. While, near the Lake Brooks you can see thousands of silver salmon. It is a true spectacle of nature. Obviously, if you want to see brown bears, you have to attend the season before their lethargy.